WANT TO PUT YOUR DREAMS ON THE FAST-TRACK TO SUCCESS? Ever think there has to be more to life than your current reality? Thomas John, MD is an international best-selling medical author, and he has also edited six medical textbooks. He is a professional keynote speaker, personal coach, motivational speaker, and corporate sales trainer. He has delivered numerous medical speeches as an invited speaker and keynote speaker both in the United States and worldwide. He has been featured globally on TV and has appeared on The Doctors Show. Internationally, he has been invited to speak in Canada, Italy, India, South Africa, Serbia, Argentina, Greece, Brazil, Mexico, Peru, and Finland. He is a Key Opinion Leader in Ophthalmology in the United States and has been listed in Chicago’s Top Doctors, America’s Top Doctors, and America’s Top Ophthalmologists. He has been featured in leading newspapers and magazines in the United States and abroad. He regularly contributes columns to various medical publications. 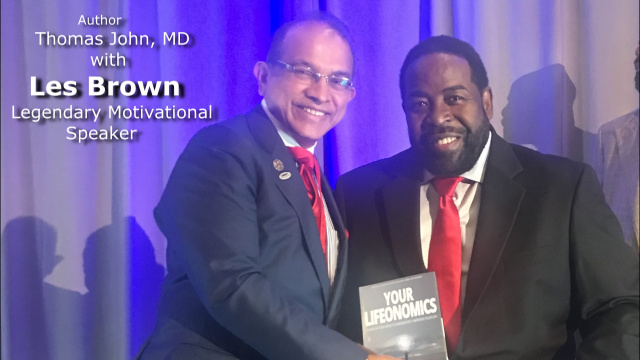 Dr. John’s mentors are Les Brown and Patrick Snow. He is the President of Downers Grove Toastmasters Club, and the VP of PR, Windy City Professional Speakers Club. He is a founding member of the Les Brown Maximum Achievement Team. Originally from India, TJ completed his ophthalmology residency at the University of Pennsylvania, Philadelphia, and his clinical cornea fellowship at Harvard Medical School, Massachusetts Eye and Ear Infirmary, Boston, Massachusetts. He was a Postdoctoral Associate at the Massachusetts Institute of Technology (MIT), Boston, Massachusetts. He is the past Director of Cornea Service, University of Chicago, and is Clinical Associate Professor at Loyola University at Chicago. He has his ophthalmology practice in Oak Brook, Oak Lawn, and Tinley Park, Illinois. TJ is also a rock ’n’ roll drummer, dancer (ballroom, line, disco), and writer. Dr. Thomas John along with his wife Annita lives in Chicago, Illinois.